For information on the most current version of this organism's data, click here: the Phytozome Physcomitrella site. Physcomitrella patens ssp patens ecotype Gransden 2004 is a species of moss, which is a basal lineage of land plants, having diverged before the acquisition of well developed vasculature. Thus, it stands in an important phylogenetic position for illuminating the evolutionary development of "higher" plants, including those that are model organisms, such as Arabidopsis, and those of commercial importance, such as poplar, corn, soybean, sorghum, and rice. Having the full Physcomitrella genome sequence is a great asset for reconstructing the evolution of plant genomes and for informing the community in the functional genomics of plants, just as the mouse, Fugu, Drosophila, and other genomes have informed animal biology. 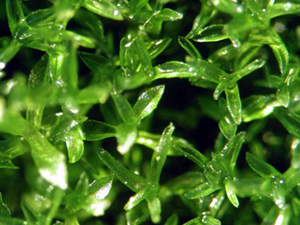 Physcomitrella is widely recognized as an experimentally tractable exemplar of this lineage. Its relatively simple morphology allows imaging of tagged macromolecules and the direct observation in vivo of various intracellular processes. Methods have been developed for the study of phytohormone signaling (i.e. auxin, cytokinin and especially abscisic acid), cell polarity formation, tropisms, and photomorphogenesis (i.e. phytochrome and cryptochrome). Physcomitrella is the only plant that undergoes homologous recombination with a frequency that allows easy targeting of genes for replacement and elimination, as has been crucial for the development of other model systems such as yeast, allowing gene function in higher organisms to be predicted. There is strong scientific interest in Physcomitrella worldwide and a good genomic infrastructure, including large numbers of EST sequences, whole genomic libraries in BAC vectors, multiple cDNA libraries, RNA interference lines, and a gene expression chip. These resources and the abilities and enthusiasm of the Physcomitrella community encourage optimism that all of plant biology, and evolutionary genomics more broadly, will benefit from the information revealed by this genome. Publication: The Physcomitrella genome reveals evolutionary insights into the conquest of land by plants. Science. 2008 Jan 4;319(5859):64-9. Epub 2007 Dec 13.